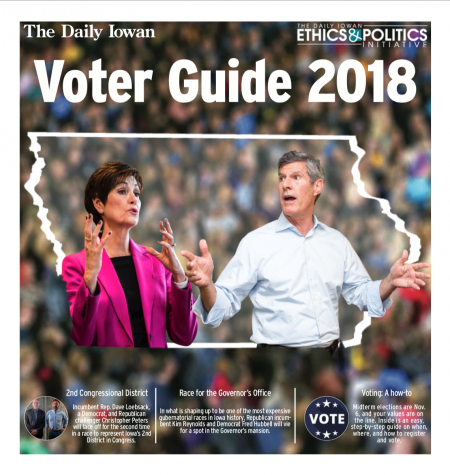 Two candidates face off in the most expensive race for the governor’s mansion in Iowa’s history. Iowa’s 2nd congressional district: Who are the candidates? In a race for Iowa’s 2nd Congressional District, 12-year Democratic incumbent Dave Loebsack faces Iowa City surgeon and Republican Christopher Peters. State Senate District 43: Who should represent Iowa City? Joe Bolkcom, a Democrat, faces University of Iowa student Pat Wronkiewicz, a Republican, to represent the area surrounding the UI in the State Senate. State Sen. Bob Dvorsky is stepping down after serving in the Iowa Senate since 1995. Two candidates want to take his place. Rod Blum, a two-year Republican incumbent is on the ballot against Abby Finkenauer, who would be one of the youngest representatives if elected. David Young, the Republican candidate for Iowa’s 3rd Congressional District has received three campaign visits from President Donald Trump and Vice President Mike Pence in a competitive race against Cindy Axne, a Democrat. Can J.D. Scholten dethrone Rep. Steve King from his District 4 seat? Republican Steve King has led Iowa’s 4th District in the U.S. House of Representatives since 2013. Democrat J.D. Scholten believes he can take the seat over. Two candidates will vie for a spot representing Johnson, Washington, and Keokuk counties in the Iowa Senate. Bobby Kaufmann, a Republican, faces challenger Jodi Clemens, a Democrat, to represent part of Johnson County and Cedar County. Who is on the ballot for Johnson County Board of Supervisors? Three candidates are running for two seats on the Johnson County Board of Supervisors. First-time candidate Deidre Dejear aims to become the first black statewide official in Iowa. She faces Republican incumbent Paul Pate to contend for a position as chief commissioner of elections. Mike Naig and Tim Gannon will both vie for a first elected term as Iowa’s agriculture secretary. Make sure you’re prepared for the Nov. 6 midterm election. Here’s what you need to know.